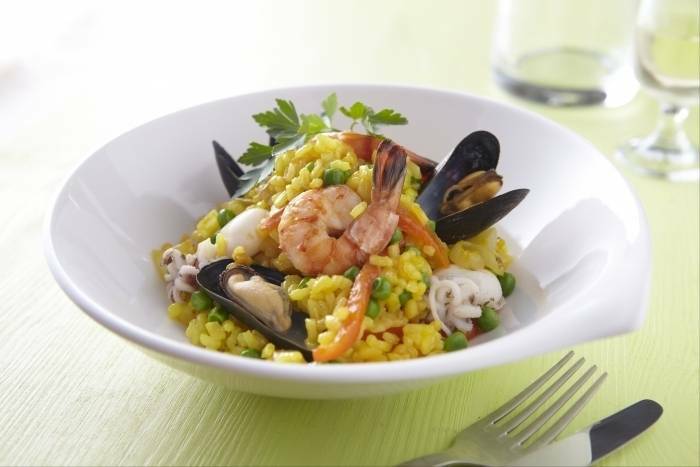 A classic Spanish paella with saffron, prawns, squid and mussels. Serve at the table, straight from the pot! Peel and dice the onion. Cut the fennel in half, remove the tough core and dice. Peel the red pepper, remove the seeds and cut into strips. Peel and finely chop the garlic. Pick the parsley leaves from the stalks and chop the leaves finely. Prepare the squid by removing the head. Keep the tentacles to one side. Clean the inside of the body under running water and remove the cartilage. Remove the skin and chop the squid into 1/2cm thick rings. Wash and de-beard the mussels. Throw any away that are open or damaged. Remove the head and shells from 12 prawns and de-vein them by gently cutting down the spine and removing the black vein. Keep 6 prawns whole for the final presentation of the dish. In a wide, flat pan heat up the olive oil. Sweat the onions and fennel until soft. Add the peppers and cook until soft. Add the garlic, smoked paprika and the saffron and cook for 1 minute. Pour in the white wine and reduce by half. Add the fish stock to the pan and then stir in the paella rice. Cook over a medium heat for 12-15 minutes. Add the mussels, prawns, peas and squid to the pan and cover with a lid. Cook with the the lid on for another 5 minutes and then check that the mussels are open, that the prawns are cooked through and that all of the stock has been absorbed by the rice. Serve the paella with a sprinkling of chopped parsley and some lemon wedges.